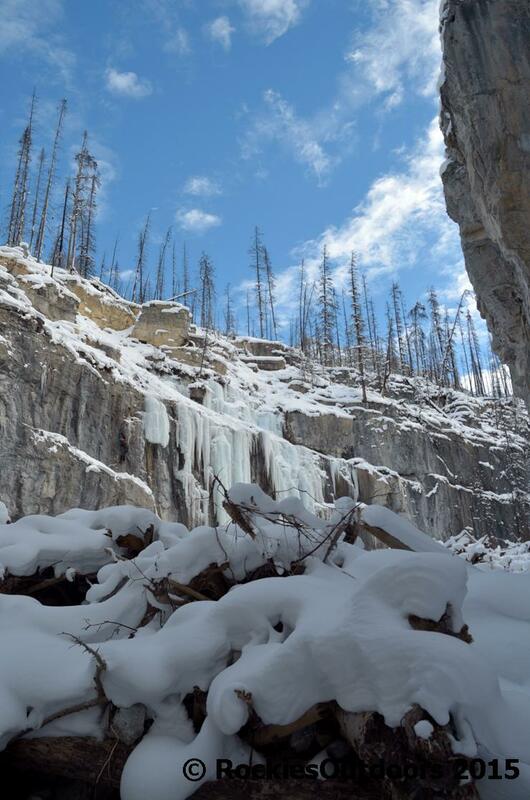 In November 2013 I took an introductory two day ice climbing course. It was an incredible experience. The first day was spent learning the basics at the Junkyards climbing area near the Grassi Lakes trail near Canmore, Alberta. 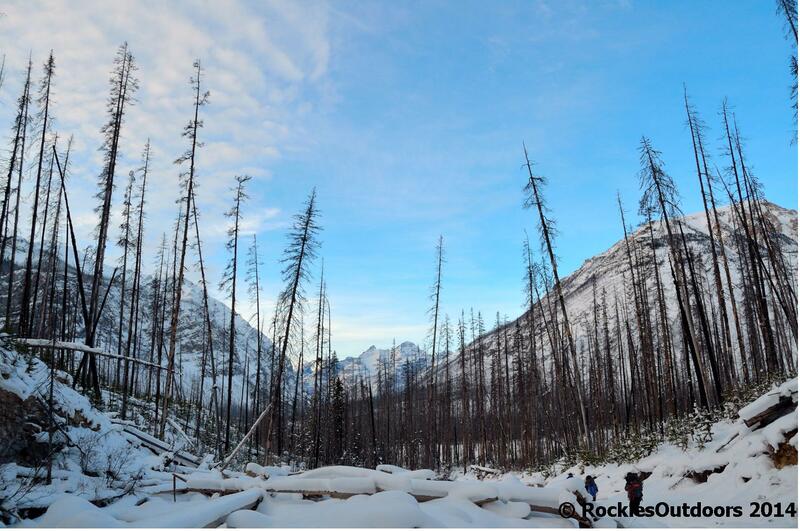 The second day we headed to Kootenay National Park, and headed to Haffner Creek. The parking lot for Haffner Creek is on the opposite side of the road to the Marble Canyon parking area, and you hike through Marble Canyon Campground to get onto the trail for the creek. 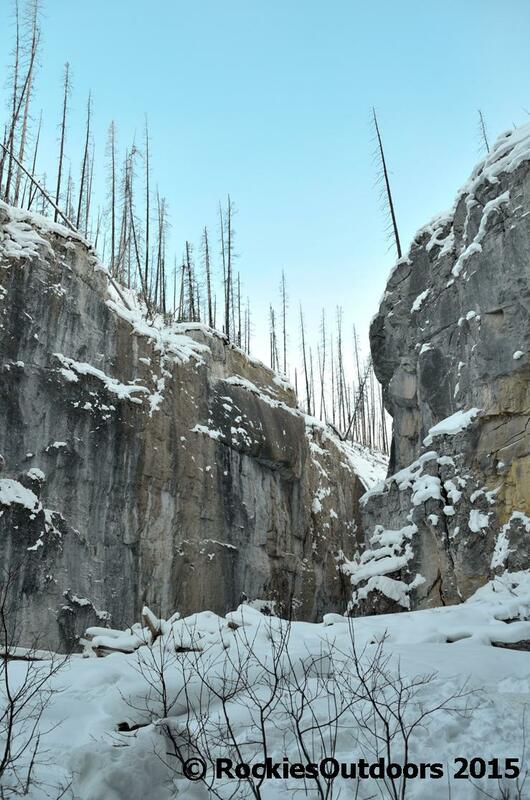 It took about thirty minutes to get to the canyon part of Haffner Creek, with the section of the hike on crampons or ice cleats. 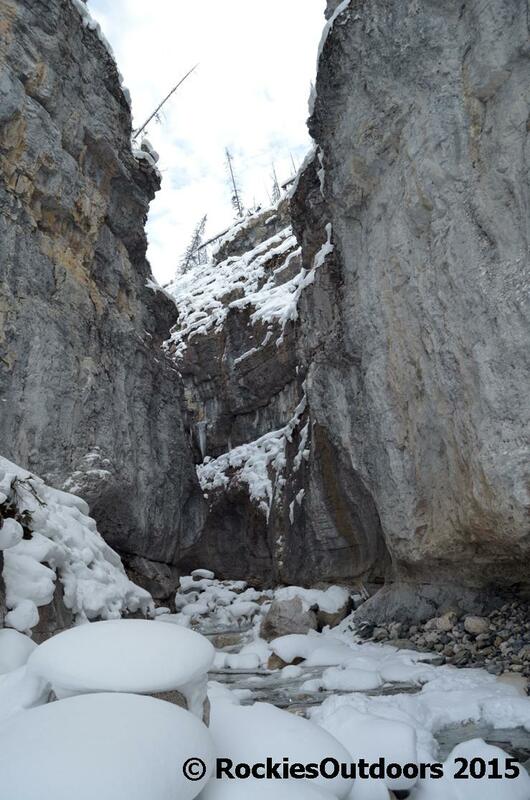 The canyon at Haffner Creek doesn’t get a lot of direct sunlight, so it was very cold when not climbing. Which was lucky, as we got to climb a lot! We were also taught how to place ice screws and make a v-thread ice anchor. The canyon was really beautiful. It would be really interesting to see it later in the winter, to see how the ice changes shape as winter progresses. 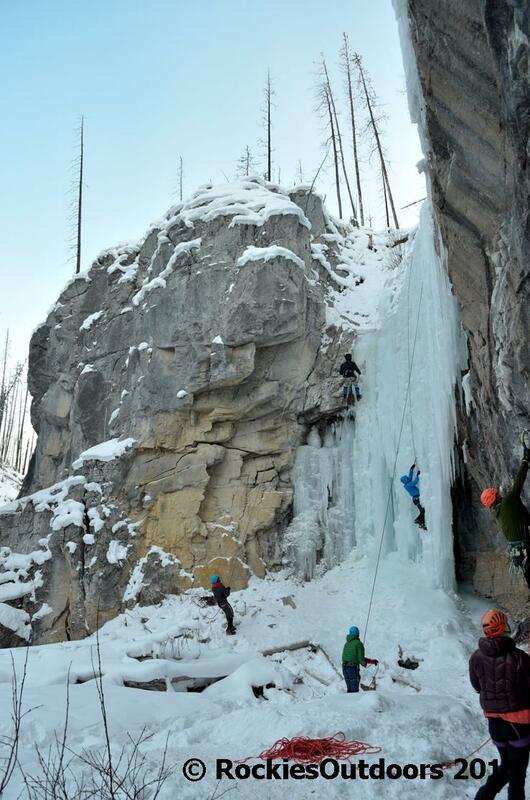 Great to see a place where you wouldn’t normally go to in winter if it wasn’t for ice climbing! After the ice climbing was finished for the day we headed back to the parking lot. 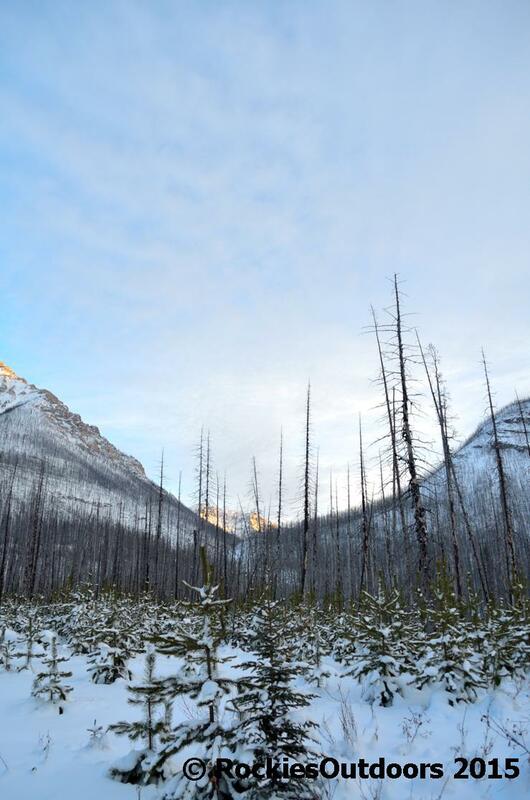 Walking through the snow-covered burnt areas of forest was a strange experience – the burnt trees contrasted the fresh white snow. Ice climbing was an excellent experience. I’d rock climbed before, and I really liked the way that you didn’t have to search for holds as you would do when climbing on rock. I really can’t recommend it more. It’s a great way to get outside in winter. 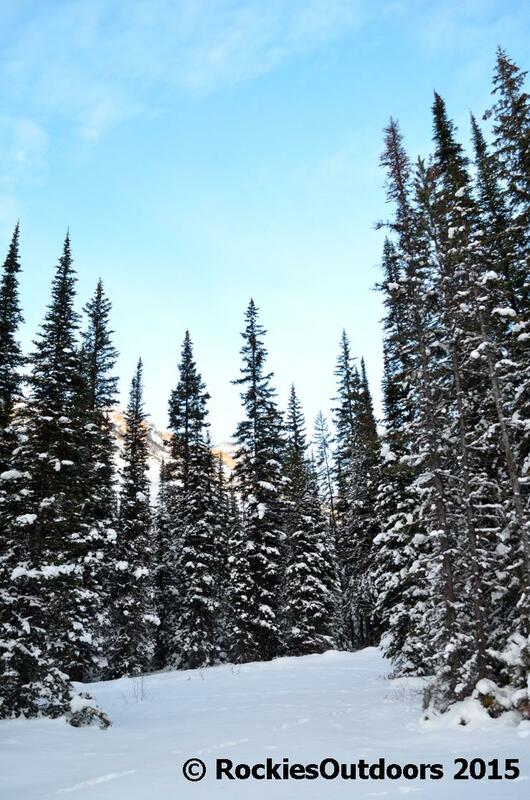 What new outdoor activities are you trying this winter? Sounds awesome! I bought my first set of studded tires to try out winter biking a few weeks back, it’s been so much fun. That sounds so much fun! I need to have a go at winter biking at some point! You really should, it is super fun! That looks and sounds like an amazing experience! Looks like fun – but my fear of height will unfortunately prevent me from every trying it myself… But I really enjoyed your pictures of the adventure! This looks fantastic. Not too much ice down here in New Mexico, unfortunately. Thanks! Your blog is really great! Wow . . . that truly is a winter adventure. Very impressive! Yes, it was so much fun, I need to go ice climbing again soon!